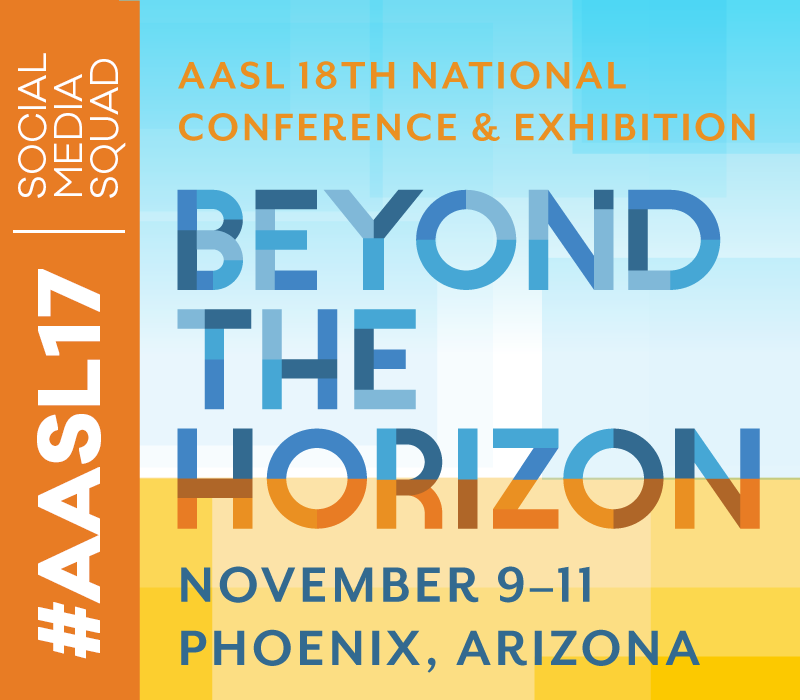 Jane Lofton's Adventures in School Libraryland: Treat yourself to PD: Join me in a Twitter Chat this week! Treat yourself to PD: Join me in a Twitter Chat this week! Twitter chats are a terrific way to get a quick booster shot of professional development, right from your home, office, or anywhere you have online access. (And don't stop reading if you don't have a Twitter account; you can still be an "observer.") I'm not sure how this happened, but I actually have THREE chats I'm co-moderating on my calendar this week. I know they are all going to be informative and inspiring, so I'd love to have you join me at one, two, or all three! First up is #NJLIBCHAT Tuesday from 5pm PT/8pm ET to 6pm PT/9pm ET. 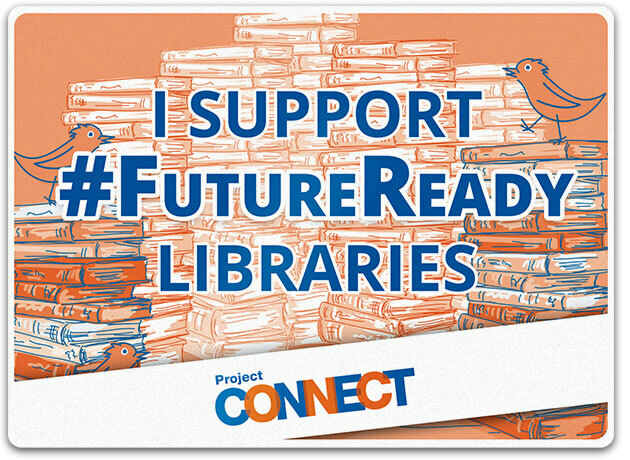 Krista Welz, New Jersey School Librarian, founded and runs this New Jersey-based school library chat, with everyone welcome. I am honored to be asked to co-moderate this month. Our topic for this month is "How Google Apps Promotes School Libraries." 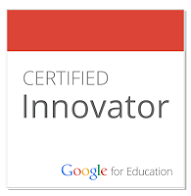 Google apps provide so many options for teaching students, helping them collaborate, promoting and managing your library, and more. 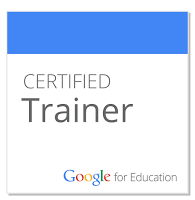 Do come share your own ideas on using Google apps, and learn from your colleagues. Next up is an #AASLStandards chat, on Thursday from 4pm PT to 5pm PT. 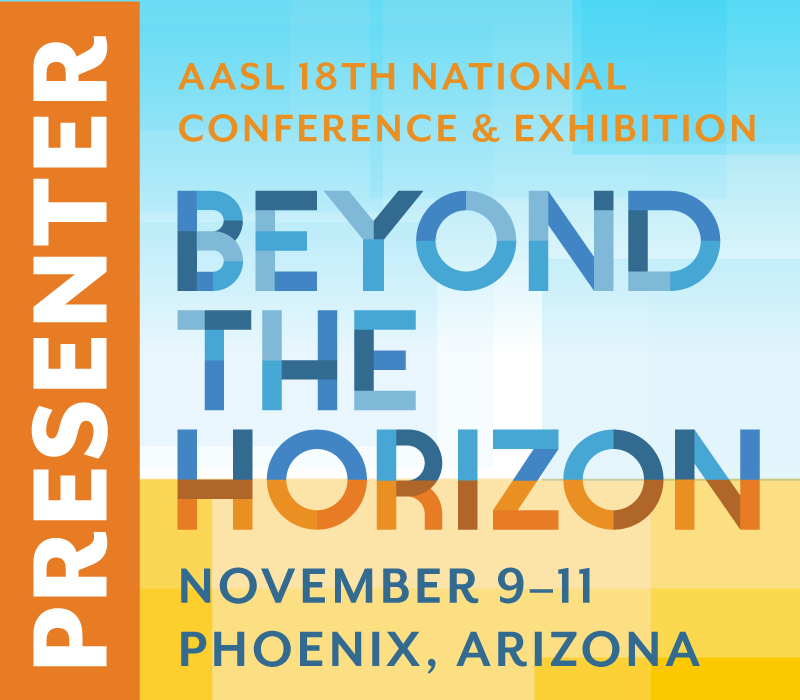 I got my copy of the brand new AASL National School Library Standards at the AASL National Conference in November. I am, frankly, in the process of absorbing and making sense of all the great content they include. 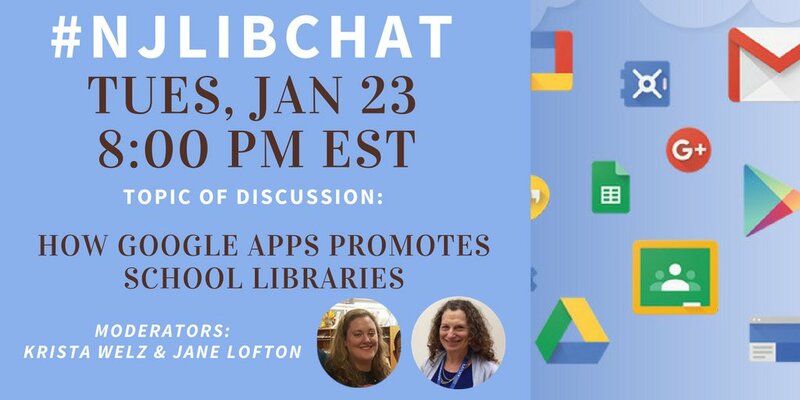 This chat is an opportunity to hone your understanding and use of these new standards for students, librarians, and library programs, and to get ideas of how best to share them with your teachers and administrators and incorporate them into your practice. Check this KnowledgeQuest blog post for a preview of the questions. 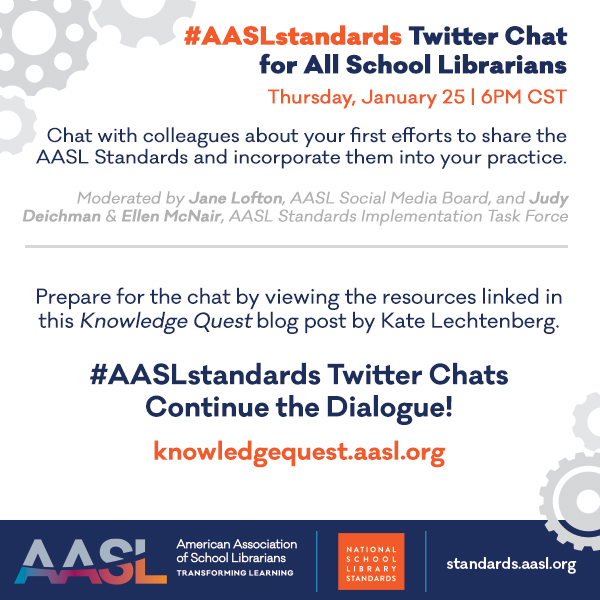 As a member of the AASL Social Media Editorial Board, I will be assisting in moderating this chat with Judy Deichman (@nms_library) and Ellen McNair (@emcnair1), AASL Standards Implementation Task Force members. 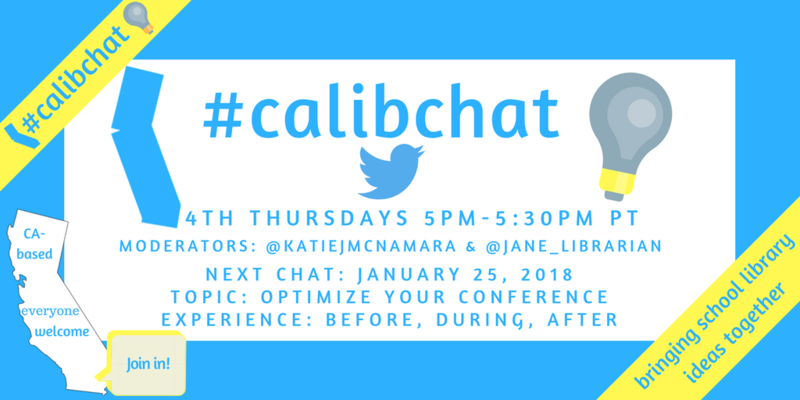 And, as soon as that chat is over on Thursday, please do switch right over to #CALIBChat, from 5pm PT to 5:30pm PT. 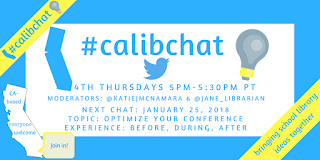 Katie McNamara (@KatieJMcNamara) and I started #CALIBChat last spring as a California-based school library chat that welcomes school library folks and educators from everywhere. We are running it once a month on the last Thursday of the month, and we made it just a half hour to fit into everyone's busy schedules. The theme for this month is "Optimize Your Conference Experience: Before, During, and After." 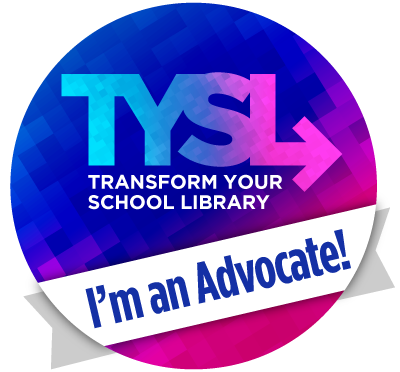 We invite you to share your ideas for taking best advantage of the CSLA 2018 Conference coming up February 1-4 in Yosemite, CA, the ALA Midwinter Conference running February 9-13, or any other conference. Click on Latest, and watch the tweets come in. I hope to see you on Twitter this week.